Learning path to become a PLC expert. Start with BIN’s three day hands-on best-practices real-world PLC training workshop for the public (1.6 CEUs) or the one week on-site PLC training. This instructor based PLC training is recommend as the starting point to create a firm foundation in which to build on. 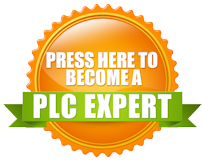 Then it is recommend that the PLC Training Video Course be completed to get a broad overview and knowledge base of PLCs. The next step recommended is BIN’s Troubleshooting PLC Control Circuits software to gain years of troubleshooting experience in just days. Then it is recommend the PLC Training 2 CD set be used to gain PLC Programming Experience. The next logical step is Advanced PLC training topics like these introductory training solution on PAC (Programmable Automation Controller), HMI, PID, and then SCADA. More advanced training on those topics and others would be dependent on equipment actually used in the facility that the person is being trained for. After all the above training, then an IE, Tech, etc. would be certified, if there was a nationally recognized body that was set up to certify Engineers and technicians on PLCs. Note: For definition of “PAC”, to learn the Difference between the old PLC and today’s PAC, << click.